I'm off to a great start for the third quarter of the finish-a-long. I started these cushion covers back in February, after I purchased the Mini Quick Curve Ruler and wanted to play with it. I have really come to love piecing curves. And these curves are so easy to sew up. I picked up some Spellbound by Cotton + Steel last fall at my LQS. 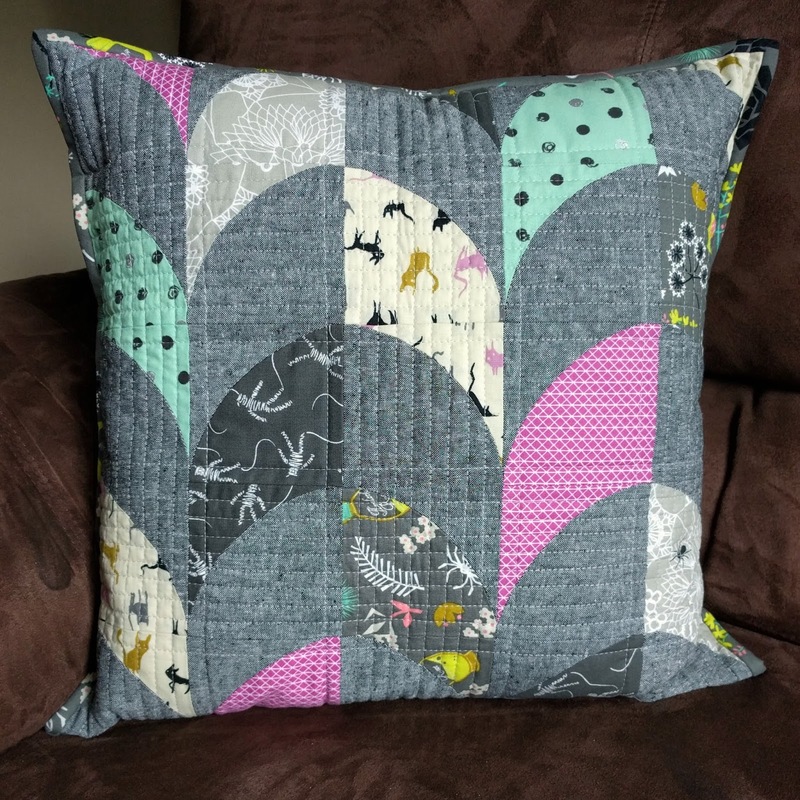 Since I already had a few Halloween mini quilts, I figured cushions would be perfect for some fall decor (let's be honest this will be on my couch very soon and won't be removed until Thanksgiving!) 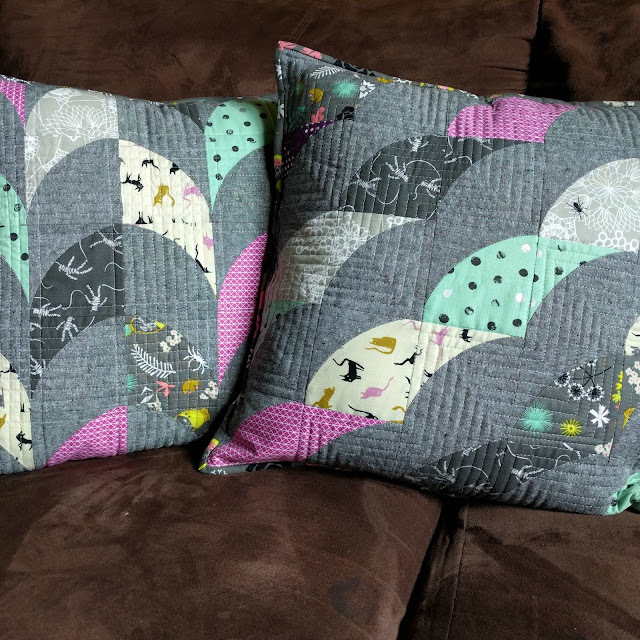 For each cushion I decided to do a different layout, as I didn't want them to be matchy matchy. The fabric coordinates and that was plenty for me. Once I started quilting them, I was on a roll and didn't want to stop until I had finished these bad boys. I love the curved herringbone of the cushion. For the quilting I did a basic grid style, but didn't fill in all of the blocks and I love the effect. I like the combination of the curved piecing with the straight line quilting, gives just a nice clean look. I like the scallop design of this cushion. For the quilting I again did straight lines, but as zigzags. I have decided I need to do more zigzag quilting! Now to make more cushion covers so I can swap them out whenever I please. Love your cushions and the fabric!! visiting from crazy mum quilts. Wow working in the curves is hard and this looks so well finished. 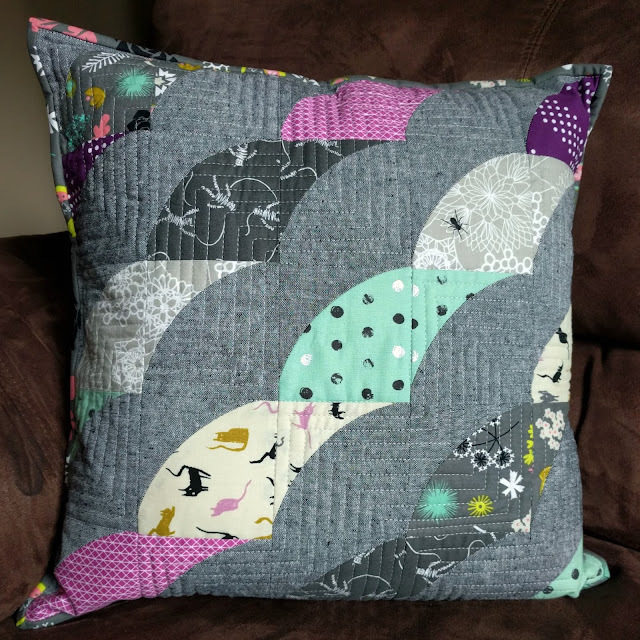 Love the pattern, love the fabric choices, love the finished results! These are just so cute! They look amazing with your quilted lines. I love to combine curves and straight lines. They compliment each other so well. Love these! Very cool pillows! You've done the curves really well! I really like these. Great job ! I love these pillows.